Spell it Ray, and it’s been worn by notable creative men, and of course, rays of sunlight. Swap the y for an e, and suddenly this name leans feminine. Thanks to Jaimia for suggesting Rae as our Baby Name of the Day. Ray Charles, Ray Bradbury, Sugar Ray Leonard. Ray is a guy’s name, one that feels kind of retro and hipster cool right about now. He’s also a name with history aplenty. Raginmund came to England with the Normans as Raimund, Reimund, or Raimond. Eventually he became the familiar Raymond, the name that every loves. Er, loved. 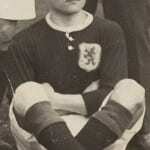 After more than a century in the Top 100, he’s on a steady decline in recent years. Still, there were at least two saints by the name, and he deserves to be considered a classic. But Ray doesn’t necessarily come from Raymond. 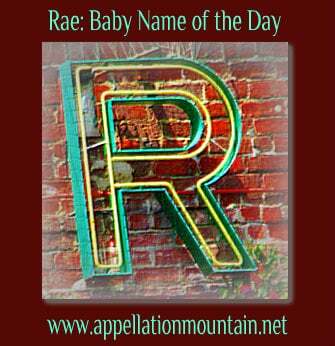 Especially if we’re talking about Rae, the name could be short for Rachel, an Old Testament appellation meaning ewe. Like Raymond, she ranks among the classics. Plenty of other feminine names contain the same sound: Raven and Reagan come to mind. Tony Award winning actress Rae Allen was born Raffaella. And then there’s the association with sunshine. From Summer to Soleil, names that bring to mind the sun are current favorites for girls. Ray of light comes from the same roots as the Latin radius – spoke. It’s a fairly recent innovation. Both Ray and Rae are also surnames, with plenty of possible origins, from the French word for king to a Middle English word for deer. All of this makes Rae for a girl feel like a modern choice, one borrowed from the boys. Only it isn’t so. From 1880 into the 1980s, Rae regularly placed in the Top 1000 names for girls. Despite her modern feel, she’s actually something of a vintage choice. 1979’s Norma Rae was based on the true story of a woman who organized a union in her textile factory. Sally Field won an Academy Award for her performance. Actress Rae Dawn Chong made her name in the 1980s. Yes, it’s her real name – she has a sister called Robbi. Nicole Kidman made her name in 1989’s thriller Dead Calm. Her character was named Rae. A recent character on the British soap opera Hollyoaks answered to the name. Do you remember the 2009 Hugh Grant/Sarah Jessica Parker flick Did You Hear About the Morgans? The pair play a couple in a witness protection program in Ray, Wyoming. At the end of the movie, they’ve adopted a daughter named Rae. We’ve also seen Rae in compound names, like Raelyn, and her sound occurs in Rayna and other names. While they’re in the Top 1000, somehow they don’t seem the most current of sounds. But Rae has a simplicity and purity that makes her stand out. Single syllable names for girls are quite stylish. From the Biblical Ruth to the botanical Fern, the surname Sloane to the virtuous Grace. If you’re after a short, frills free name that splits the difference between the modern and the traditional, Rae could be the name for you. I’ve a female cousin with the middle name Rae after her father’s first name Ray. In that case it’s okay, but I usually don’t like it, as it feels déclassé and a bit hick-ish. I dig Rae as a middle name for girls. At least it’s not Rose. Thank you so much for featuring this name. 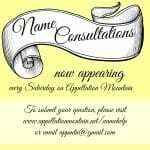 This is the name of my grandmother (well middle name her first is Elsie) however she goes by Rae. It is also my sister’s middle name. Because it is unisex I personally wouldn’t use it as a first name however I think it works especially well as a middle name. It could be an unexpected alternative to similar sounding names like Mae, Maeve, and Faye. It also feels naturey with the link to sun rays – I love that. Rae is a very special name to me and I’m glad that it means more than ewe. I was all ready for Tia or Gia today. But about Rae… well, it’s a choice I can respect but isn’t really my style.